Is the goal of ending hunger and undernutrition in 10 years achievable? 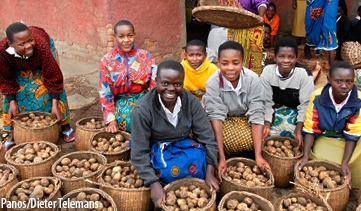 Eliminating hunger and undernutrition in 10 years is a huge task, but it can be accomplished. Brazil, China, Thailand, Peru, and Vietnam have each dramatically reduced hunger and undernutrition in a relatively short time. Learning from their experiences, further empowering women, and leveraging strong international and national commitments to end hunger and undernutrition make it possible to accelerate progress even further. Note that achieving the goal may still leave about 5-8 percent of the population suffering from hunger and undernutrition, as these are levels comparable to those seen in a number of developed countries. How does Compact2025’s target date to end hunger and undernutrition by 2025 relate to other target dates that focus on 2030, especially the Sustainable Development Goals (SDGs)? The 2025 target relates to many of the SDGs because ending hunger and undernutrition are stepping stones to ending extreme poverty—the central theme of the SDGs. Have others adopted the goal of ending hunger and undernutrition by 2025? A number of key stakeholders and initiatives have adopted 2025 as the year by which hunger and undernutrition are eliminated, including the African Union in the Malabo Declaration and the FAO through the Decade of Action on Nutrition—a decade that began in 2015 after the Second International Conference on Nutrition (ICN2). There are many manifestations of malnutrition—what exactly will Compact2025 aim to eliminate? What about overweight and obesity? Compact2025 aims to end hunger, taking FAO’s definition as the consumption of fewer than about 1,800 kilocalories per day, and undernutrition, particularly in the forms of child stunting and wasting and micronutrient deficiencies in all individuals. While the goal of eliminating overweight and obesity is increasingly important for human, economic, and ecological well-being, it is outside the present scope of Compact2025. Efforts on the part of Compact2025 may nevertheless contribute to ending malnutrition in all its forms. Compact2025 focuses on food security and nutrition, which are different and involve different actors. To tackle undernutrition, will Compact2025 encompass non-food system policies and actors? Indeed, food security and nutrition are distinct concepts that require multisectoral solutions. Compact2025 will take broad, pragmatic approaches that involve non-food policies and actors. For example, it will promote social protection-led strategies, women’s empowerment, and nutrition-sensitive sectors such as water, sanitation, and hygiene (WASH). Compact2025 will also look to ICTs and social marketing in its efforts to find and disseminate innovative solutions across all of the above areas. What does the “Compact” element of Compact2025 actually entail? Being a member of Compact2025 signals buy-in for stakeholders across multiple sectors to work together at the country level to end hunger and undernutrition by 2025. How will Compact2025 relate to other compacts and initiatives (e.g. Nutrition for Growth, SUN)? Compact2025 will complement other compacts and initiatives that have similar goals through its global Knowledge and Innovation Hub. The Hub will develop evidence-based options for action in the policy and implementation domain, including how to leverage multiple sectors (e.g. agriculture, health, and nutrition), and linkages between each sector, to efficiently and effectively eliminate hunger and undernutrition. Compact2025 will also complement SUN and other initiatives by supporting country-led plans and strengthening country capacity to collect, share and use data. It will also enhance accountability for nutrition goals and actions by promoting monitoring and evaluation systems and regulatory mechanisms for effective targeted impact. Is it IFPRI’s comparative advantage (as an international research organization) to initiate Compact2025? As an international research organization, it is IFPRI’s comparative advantage to identify and fill knowledge and innovation gaps in eliminating hunger and undernutrition, and by bringing together countries, donors, and decision makers across multiple sectors who want to know the most efficient and effective ways to do so. Though Compact2025 is initiated and facilitated by IFPRI, it will include a range of partners working together. Leaders from international organizations (IFAD, WFP), countries and regions (Ethiopia, Malawi, African Union), the private sector (UPL Ltd), other research organizations (M.S. Swaminathan Research Foundation), and non-governmental organizations (Helen Keller Intl) are among those championing Compact2025. How will Compact2025’s Knowledge and Innovation (K&I) Hub complement other knowledge networks? The K&I Hub will produce research and promote innovation that will fill knowledge gaps in how to efficiently and effectively end hunger and undernutrition. In filling these gaps, the K&I Hub will work closely with other K&I initiatives to help link them and serve as a hub for international public goods, accessible to all knowledge networks. For example, the K&I Hub will collaborate with other networks to gather information about what does and does not work for a collection of best practices in policymaking and implementation for nutrition (i.e. the proposed Nourishing Millions project). How will Compact2025 relate to existing country plans, including those informed by Scaling Up Nutrition (SUN)? Compact2025 will support focal countries in further developing their country-led plans, irrespective of their membership in SUN or other initiatives. Compact2025 will work to support existing plans, including those developed or informed by SUN members. The main work appears to be through the IFPRI secretariat working with in-country collaborators. Is this feasible for more than a few countries? The main work of Compact2025 will be to support country-led efforts, which requires strong partnerships with in-country collaborators. Initial work will begin in select focal countries where hunger and undernutrition are concentrated and where national leaders are committed to the goal, and will expand to other countries based on these criteria. Will the Technical Advisory Committee include experts beyond researchers who can offer operational advice? Yes, the Technical Advisory Committee will also include development practitioners to draw upon recent advances in program implementation and offer operational advice. How will the Leadership Council relate to/interact with other leadership groups (e.g. SUN’s Lead Group)? There is overlap between the Compact2025 Leadership Council and the SUN’s Lead Group. Such overlap can promote mutual learning between the two groups and help support greater complementarities.